CPR & First Aid Certified Guides with Many Years Ocean Experience - the Best! NOTE: There are no "children's rates" on these tours ... price is per "paddler." The reservation form asks for the number of children under 12 just so that they know how many younger paddlers are in the party and so they can have appropriate equipment ready for them. For odd number of guests, a single person will ride solo. This trip is a longer version of the Turtle Reef paddle, but adds a second snorkel location. The total distance covered is about 4 miles and is open to all ability levels (minimum recommended age is 9). This trip offers the opportunity to see turtles at two different snorkel locations. This 4.5 hour trip starts at 7:00am at Makena Landing which is in South Maui a little beyond the Wailea area. Snack and beverages are included. 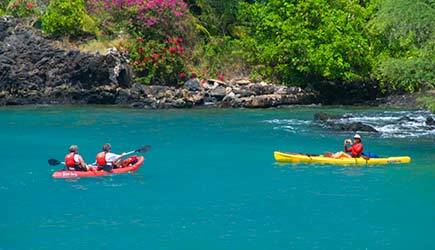 This trip is planned as a leisurely paddle around Makena Bay available to all ability levels and ages (recommended minimum age 5). Whether it's the first time on a kayak or experienced paddlers, this is a wonderful experience. The highlight of this tour is snorkeling with the Hawaiian green sea turtles. This 3 hour trip starts at 7:30am at Makena Landing which is in South Maui a little beyond the Wailea area. Beverages and snacks are included. This adventure is a very impressive trip with secluded snorkeling sites as well as some truly fantastic views of the Pali Sea Cliffs. The rugged shoreline in this area is a quiet and secluded part of Maui rarely experienced by visitors. A roundtrip paddle along the picturesque shoreline, you will be amazed with the sharp sea cliffs leading down to the waters which are surrounded by stunning coral reefs. Guests are treated to colorful reef eco-systems, and a vast array of vibrant reef fish ... ranging from delicate cleaner wrasses to the colorful parrot fish. The prospect exists to see dolphins, rays, and whales (in season). This trip is a 4.5 mile round-trip paddle and the tour is 4.5 hours in length. This tour begins at the beach park locally known as "Granma's" which is between mile marker 10 and 11 along the Pali Highway a few miles west of Maalaea. The tour begins at 7am. Snack and beverages are included. You do not have to have kayak experience, but you do need to be in reasonably good physical condition for this tour. Children under 14 need special approval for this tour. 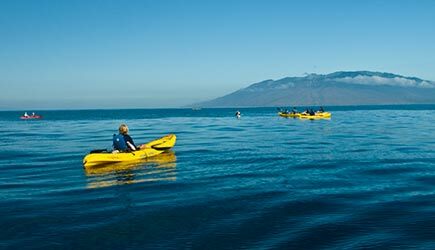 Note: If wind conditions are not favorable for kayaking the Pali Coast, this tour will be relocated to Makena and follow the itinerary of the South Shore Explorer. For guests staying in West Maui, this will require an additional 25 minute drive. 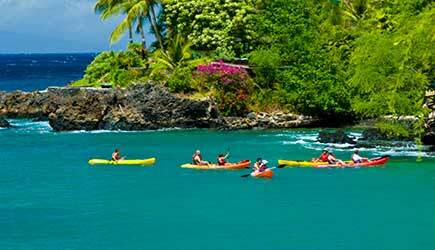 This trip is a leisurely paddle around the reefs of the Olowalu shoreline on Maui's west side and provides a convenient trip for people staying the Lahaina / Kaanapali / Kapalua area. It is available to all ability levels and ages (recommended minimum age is 5). This area has some nice shallow-water reef that extends for a long distance from shore. Lots of turtles inhabit this area. This 3 hour trip starts at 7:30am about 10 minutes east of Lahaina along West Maui's southern coast. Beverages and snacks are included. 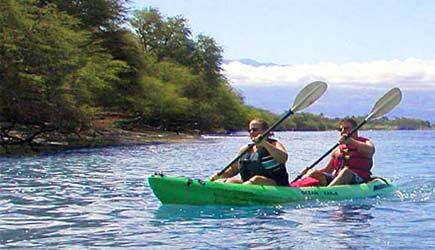 NCL cruise ship passengers in Kahului are able to do any of these kayak tours on their second day in port. Transportation is not included, and is most economically done by renting a car. We can arrange a rental car with shuttle pick-up at the harbor; rates vary throughout the year but start around $40 per day in low season; see our rental car page for more information. Drive time is approx. 30 minutes for all tours. Lahaina cruise ship passengers can do these tours only on day 2 (assuming your ship is spending the previous night in Lahaina). All tours are within a 20 minute cab ride from Lahaina, except for the Turtle Reef and South Shore Explorer which are about an hour away and would require a rental car. I am very familiar with South Pacific Kayaks and their operation. I've purchased two kayaks from these guys over the years. 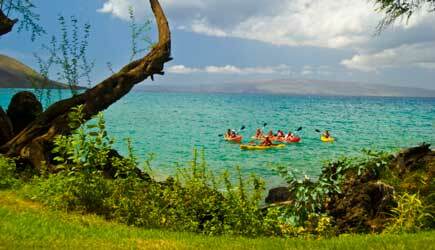 They are the premier kayak outfitter on Maui, and I recommend their tours highly. There are lots of other kayak companies; some of them are OK and some of them scare me. Go with the best ... these guys really know what they are doing. The shorter 3 hour tours are suitable for most people in reasonably normal physical condition. The longer tours are a little more demanding and require a little better level of conditioning, but do not require an extreme level of fitness. Most of the kayaks are tandem, so the work load is spread out between two people. The short tour (3 hours) goes to a spot called "Turtle Town" which is aptly named ... there are many sea turtles here and they are quite used to people swimming around them. You wouldn't know they are an endangered species from the numbers of them that are seen in this area. This is an easy-going paddle trip with kids. This might be the trip for you if you've never paddled a canoe or kayak before, and aren't very familiar with the water. If you don't have kids and you are staying in South Maui, do the longer version that includes lunch and a second snorkel stop. If you do have a little paddling experience, try the 4.5 hour Pali Sea Cliff Discovery. Many people who live here on Maui have never seen this area up close from water's level. 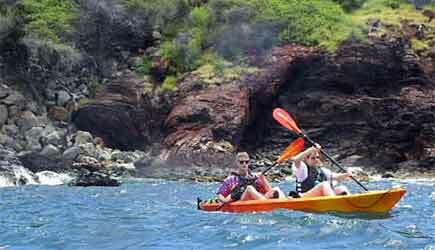 Access to this area is extremely difficult unless you are a mountain goat, or on this kayak tour! For vacationers staying in West Maui, the most convenient trip is the West Side Snorkel Safari (formerly known as Ukumehame snorkel) ... the area where this trip goes has some excellent reef that extends far off shore (further than most people would want to swim). This gives you a chance to snorkel with coral and lots of fish in places that shore-based snorkelers don't go. I recommend that you plan a kayak trip near the beginning half of your vacation. If wind or ocean swells force a cancellation of your tour, you have the opportunity to reschedule for a few days later when conditions are more favorable. Some people ask, "Can't I just rent a kayak and paddle around on my own?" Yes, there are beaches that have double kayaks available to rent for about $40 an hour. They will only allow you to paddle within a few hundred yards of the beach. Going further requires the knowledge of an experienced guide ... someone who is familiar with Hawaii's tricky winds and ocean currents. If you see a kayak trip called "The Marine Reserve Explorer" advertised on other websites, they aren't being updated promptly. 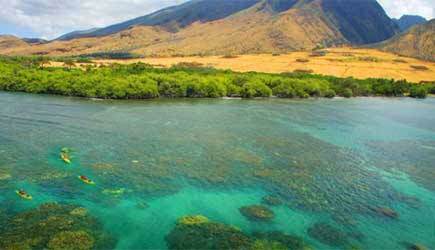 The Ahihi Kina'u Marine reserve in the La Perouse bay area is no longer open to kayaking. The state has decided to close the reserve to all kayak tour companies. Due to the explosive growth of kayaking companies on the South Shore, some of whom are less than reputable and/or properly equipped and experienced, the state of Hawaii has banned ALL commercial kayak trips in the Marine Reserve. This trip is no longer available with any company. This includes the trips that other companies have sold with some sort of guarantee (or strong insistence) that you will likely be able to swim with dolphins on your kayak trip. Dolphins do frequent the La Perouse bay area in the mornings, but there are no tours available in this area and rental kayaks are not permitted there either.